With a real gun/ammunition system the target velocity optimization is of secondary importance. A well chosen combination of penetrator length and diameter is relevant. The 120mm smooth bore L44 gun is a good example for showing this. On the basis of �120mm Tungsten Penetrator Design� � see under downloads � the accelerated masses and the corresponding muzzle velocities were calculated for a lot of feasible penetrator geometries. The perforation equation provided the perforation lengths at a single plate target with a hardness of BHN235 under an obliquity of 60�. The diameter along the penetrator length was supposed as shown in the following graph. 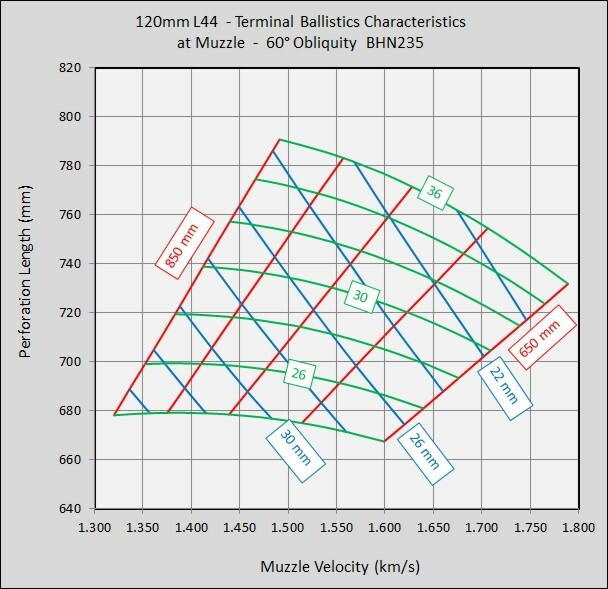 The following graph shows the perforation results at the muzzle. The perforation calculation for a penetrator with a length of 800 mm and a diameter of 26 mm you find "here". Long and thin penetrators perform best. For all ratio of L over D the optimum velocity is within the wide range of 1300 to 1500 m/s. 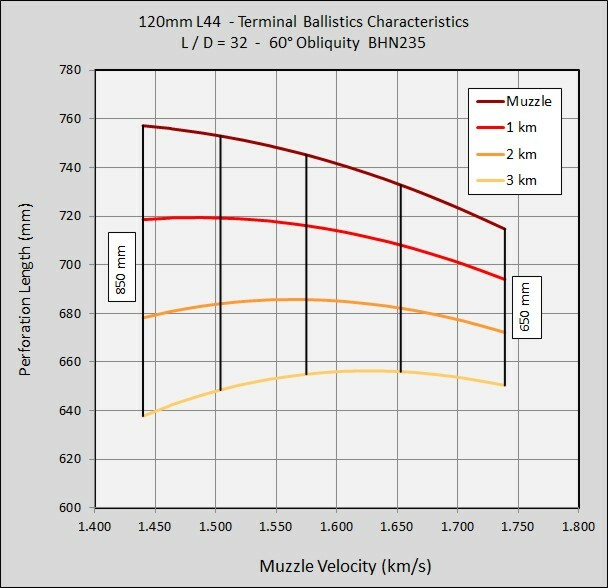 In the caliber 120 mm penetrator with lengths greater then 850 mm are not feasible. For best perforation you have to make the 850 mm penetrator as thin as possible. I think that L over D of 36 (D = 23.6 mm) is the maximum possible value. The findings are only valid at muzzle. If you consider real combat ranges such as 2 km then it looks quite different as you see in the following graph. The optimum velocity is now in the region of 1500 to 1650 m/s. The best length is reduced to 750-800 mm. 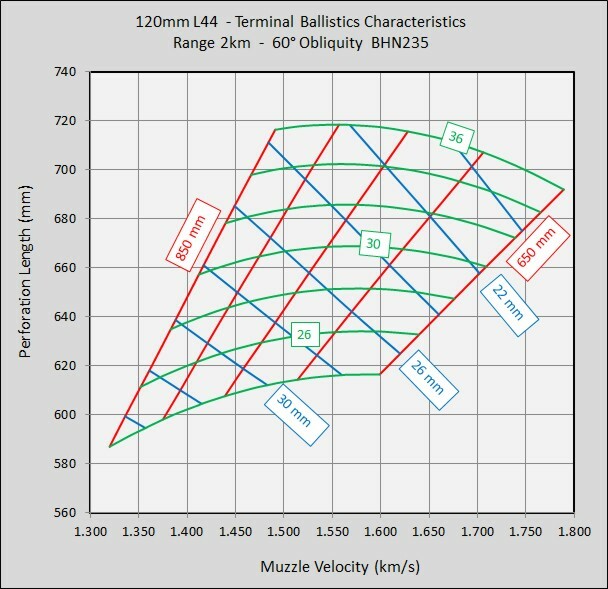 The following graph shows the perforations of penetrators with L over D equal 32, different lengths and ranges from muzzle to 3 km. If we don�t include the perforation at muzzle then a penetrator length of 700 mm gives the best overall performance.